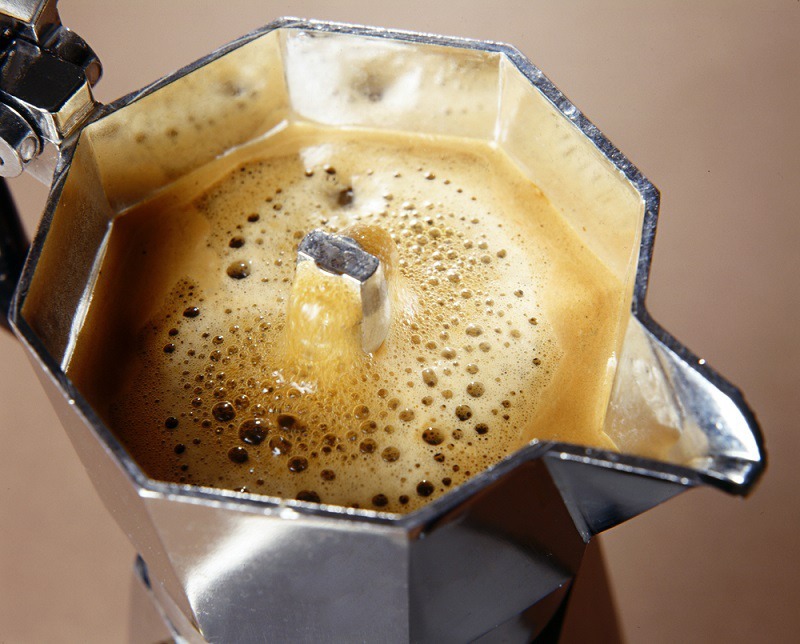 Once the standard method of brewing coffee, percolators faded from popularity starting in the 1970s with the advent of drip and single-use coffee makers. Percolators are starting to make a comeback among those craving a bit of nostalgia or who like their coffee rich and full-bodied. They are still commonly used at church and other gatherings where large amounts of coffee are required. 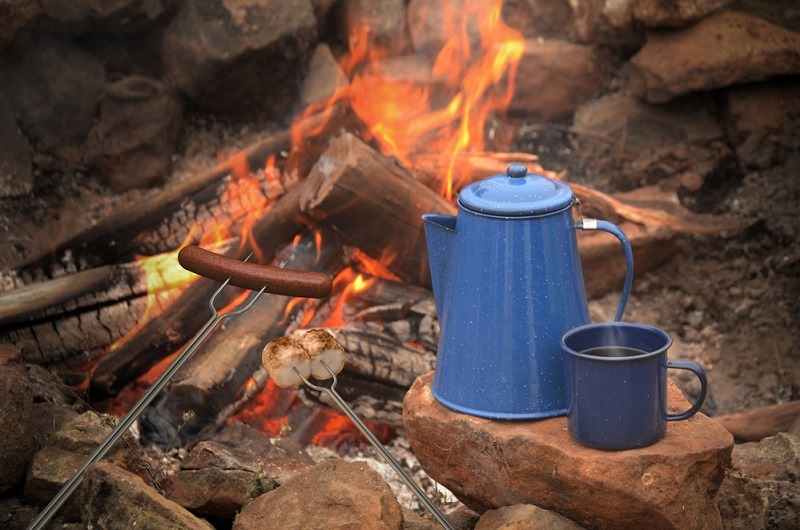 Percolators are also a favorite among outdoor enthusiasts since they do not require electricity and can be placed over a campfire. The first percolating coffee pot was made in the early 19th century by Sir Benjamin Thompson. His dislike of both alcohol and tea lead him to turn to coffee. The first U.S. patent for a percolating coffee pot that had all of the elements of today’s version was issued in 1889 to an Illinois farmer by the name of Hanson Goodrich. The version of the percolator that most people are familiar with features a bottom chamber that is placed on a heat source, typically a stove. Electric models contain a heating element and do not require a stovetop. There is a vertical tube that runs from the bottom chamber to the top of the percolator. A perforated chamber is situated at the top of the tube and holds the coffee grounds. As the water in the bottom chamber starts to boil, it rises through and out of the top of the vertical tube. The water flows through the perforations in the top chamber where it steeps the coffee grounds. The water then exits through perforations in the bottom of the coffee chamber and forces more water up through the tube. The cycle repeats until the liquid approaches the boiling point, and the coffee is ready to drink. The coffee is ready when the percolator stops making its characteristic spurting sound. The percolator needs to be removed from the heat at this point to keep it from becoming bitter. Most electric percolators will automatically turn down the heat once the brewing is finished so that the coffee stays warm but does not boil. Percolators come in stovetop, electric, and microwave versions and work by either pressure or gravity. • Pressure percolators are typically comprised of three sections that are screwed together. The lower section holds the water. The grounds go in the middle section. The upper section houses the brewed coffee. When the water in the lower section reaches a boiling point, it creates steam. The pressure from the steam forces water up through the tube where it steeps the coffee grounds. The steeped coffee is then held in the upper section. • As the name suggests, a gravity percolator uses gravity to continuously cycle water through the grounds until the brew reaches the desired strength. This type of percolator generally consists of a bottom chamber to hold the water and a vertical tube that is topped by a perforated basket. As the water in the lower chamber is heated, it is forced up through the tube where it then pours down over the grounds in the basket and back into the lower chamber. The process repeats until the liquid approaches the boiling point. Although disparaged by some coffee lovers, percolators are convenient, easy to use, offer a distinct brewing quality, and a comforting aroma and perking sound. When purchasing a percolator, you much first choose between a manual and an electric option. If you would prefer not to have to be available to remove the percolator from the stovetop, an electric model may be a good choice; however, the automatic “keep warm” function can result in burned coffee. You also want to look for a model that is easy to disassemble and clean. You also need to consider how fine the sieve is in the filter basket. If it is not fine enough, you can end up with grainy coffee. Another option is to use a paper filter disc or a coarser grind of coffee. Percolators that are enameled on the inside or made from stainless steel tend to provide the best flavor. Aluminum models tend to alter the taste of the coffee, especially when they get older. The amount of time it takes for the percolator to come to temperature and switch to perk mode is also an important consideration. Ideally, the percolator should finish brewing your coffee in 3 to 4 minutes. It does take a little practice and skill to know how to make coffee in a percolator without over-extracting and winding up with a bitter brew. Try to keep in mind the old saying “coffee boiled is coffee spoiled.” To brew coffee using a percolator, you need to follow these steps. • Open the percolator and add water to the bottom chamber. You should allow approximately 6 to 8 ounces of water for each serving. Be sure that the water level will be below the upper basket once everything is assembled. • Add the tube and chamber assembly to your percolator. • Add your coffee grounds to the basket. You will want to use a very coarse grind, even coarser than you would use in a French press, to keep the grounds from passing through the holes in the bottom of the basket. You should allow about 1 tablespoon of coffee per serving. You can always adjust the amount to suit your personal tastes as you get used to the method. • Place the percolator on a heat source, or plug it in if it is electric. • Allow the coffee to percolate for about 3 minutes until the “perking” action stops. Reduce the heat at this point to keep the coffee from becoming too strong. Whether you choose to use a drip coffee maker or percolator really comes down to personal preference. There are those who believe that the repeated boiling and recycling of the water through the grounds is a travesty against coffee and that the resulting brew is too tarry and bitter. Proponents of the percolator enjoy the distinctive aroma of percolated coffee. The cost of making percolated coffee is less than that of drip coffee, and percolators are extremely portable. For the best results, you should choose coffee that is low in acid to ensure that the final brew is as smooth as possible. 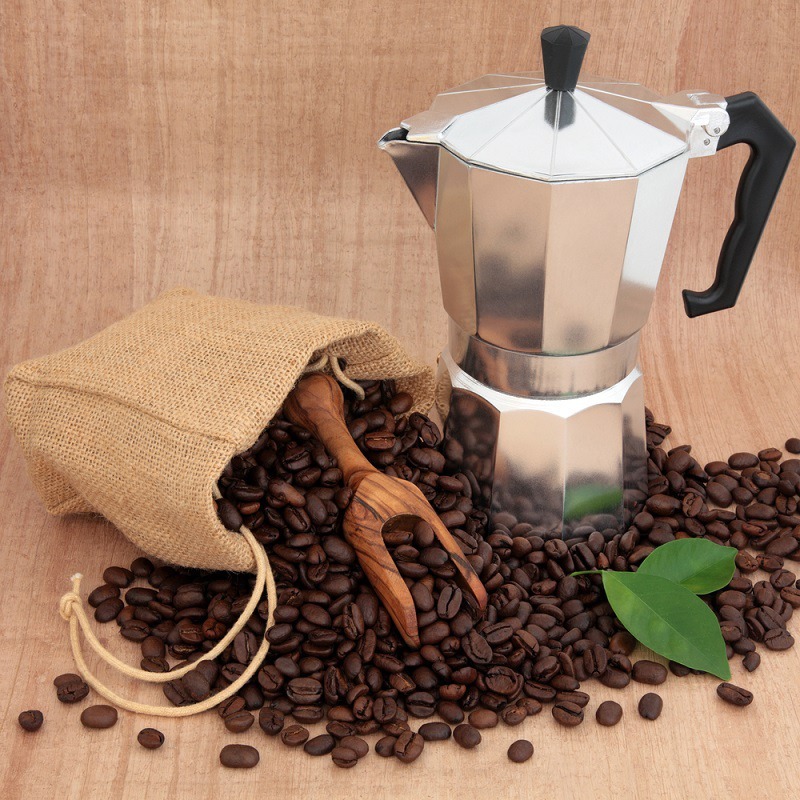 Percolators are available in materials other than aluminum so that your coffee does not end up tasting metallic.